﻿(Courtesy of Mark Huber) Utah Woodturning Symposium’s Instant Gallery at Utah Valley University will show former Park City resident Mark Huber’s works this weekend. Huber still donates pieces to Artique in Kamas. Many Summit County art lovers know the woodturning work of former Park City resident Mark Huber. He creates everything, from salad bowls to cups and other containers, with hand tools and a lathe. He also donates some of his works to Artique in Kamas. "Woodturning is the kind of thing you can do for as long as you want, or even just for an hour," Huber said during an interview with The Park Record. "You don't have to wait for the weather to warm up and you don't even have to finish a project right away once you start." 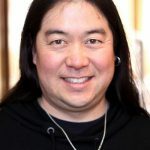 In addition to his works at Artique, the public can view his works at the annual Utah Woodturning Symposium that will be held May 11-13 at Utah Valley University. Huber's work will be displayed among 500 other woodturning works in the symposiums Instant Gallery. "The symposium will ask woodturners to bring in some works for the gallery," Huber said. "Some of the works are from vast collections, but most of the pieces were created within the past year." "The symposium flies some of the top woodturners in the world to do demonstrations," he said. "We have people from Australia, England, Colorado, California, Virginia and Utah, and some of these people are fantastic artists." Huber, who used to own a small construction business in Summit County, got into woodturning while he lived in Wanship. "I lived in Park City from 1984 to 2008 and then in Wanship from 2008 to 2016," he said. "I bought a lathe in 2000, because I remember doing it in school and I liked doing it because I'm an old carpenter. But after I bought it, it sat in the box until 2008. That's when things in the construction business got slow and I had time. So, I uncrated the thing and started doing a little woodturning." Huber said woodturning is his happy place. "I think you should do something fun every day because that's how life is," he said. "Woodturning gives me something to concentrate on that isn't work, so it's very stress relieving, because when you have this big piece of wood turning on the lathe, and you can't think of anything else like work the next day. "I can sometimes go out and start turning and then three-and-a-half hours later tell myself I'd better stop for a while." Huber, who also led the construction of the Kimball Junction transit center, discovered the Utah Woodturning Symposium after he did some research. 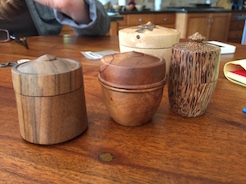 "I discovered that Provo, Utah, is a world center for woodturning," he said. Back in the mid-1970s, Dale L. Nish, an industrial arts teacher at Brigham Young University, published a book, "Creative Woodturning." "The book sold extensively in the United States and Dale began contacting people and friends to get together, which would later become the symposium, Huber said. "This was more than 30 years ago and it has grown ever since," he said. Huber's work is mostly done as gifts. "I'll bring something to the office and if someone likes it, I'll give it to them, or they will offer to buy it," he said. "Every once in a while I'll do a group of them and give (them) to Katie Stellpflug at Artique and she'll sell them." Huber uses different types of wood. "Sometimes it's called FOG — found on ground," he said with a laugh. "A lot of times woodturners work with what is called urban timber that people cut down and haul to the landfill. I'll watch someone cut down a tree and then go and ask them for some wood." Huber likes working with walnut, sycamore — which is sometimes called Lacewood — and maple. "There are two types of maple: silver and Norway," he said. "Some of the pieces that have a lot of figure (design) in them are made from Norway maple." While Huber became more invested in his hobby, he found there are some misconceptions about woodturning. "One big one is that you have to have a background of building or working with tools to woodturn," he said. "I think it takes more of an artist's touch to do this. You can even buy small lathes and turn jewelry. "You don't have to make a big 24-inch salad bowl. You can just do a lot of woodturning that is smaller than a teacup." Huber said his biggest reward is losing his thoughts in his work. something I have turned," he said. Woodturning works by Mark Huber will be on display at the Utah Woodturning Symposium's Instant Gallery that will be held from Thursday, May 11, to Saturday, May 13, at Utah Valley University. Admission to the gallery is free and open to the public. Admission to the symposium is by registration only. To register, visit http://www.utahwoodburining.com.